Squids, Crabs, Shrimp, Stingrays, Puffer Fish, Flounder, Jellyfish, Anchovies and sometimes even Sea Horses. A fascinating adventure for all ages. Watch your kids light up as they get up-close and personal with creatures from the deep. Our Sea Creature Trawling trip really brings in the praises from both the kids and the adults. Being able to see and touch so many different kinds of sea creatures is something most people have never had the opportunity to do. And I am talking about both kids and adults. Did you know a flounder has eyes on one side of its face? Did you know when they are really young their eyes are on both sides of their face? Have you ever seen or touched a squid that wasn’t named Calamari? Well, you get your chance on our Sea Creatures Trawling trip. 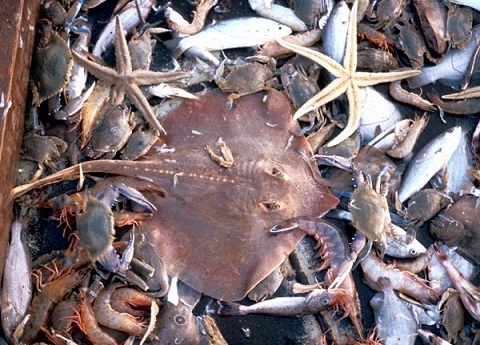 There are many types of rays, some that don’t sting. We will see what comes up. Have you ever seen a shrimp or a crab that was still alive? Both are fascinating. Captain Joe will make short drags with his net and bring up some of the most interesting fish found in the waters around Gulf Shores and Fort Morgan. You will be allowed to touch those creatures that will not harm you, and get to take a close look at things you may have never seen. Your kids will never forget the excitement they experienced aboard the Dottiejo, and neither will you.